On my way to see VC of UPM last week,I saw painted cycling lanes.This is a good beginning to get students to cycle to attend lectures.According to VC Datuk Mohd Fauzi Ramlan,he has also built covered walkways to get students to walk to attend lectures instead of waiting for the buses.As a supportor of healthy lifestyle through walking and cycling,may I wish UPM's initiaves a success and congratulate the VC for taking the lead on Green Campus.How about other university campus?Your feedback are most welcome. 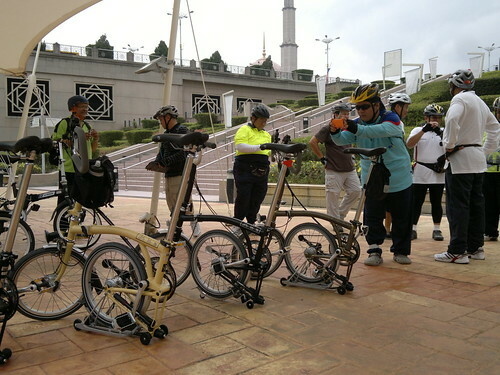 Below is a photo of a cycling event(Gaza Ride) taking place in Putrajaya.I am happy to see more and more people are cycling especially with their friends and family members. This is a figment of my imagination in the form of a simple sketch of a bridge spanning over the labyrinth weirs located at Taman Seri Empangan,Presint 5,Putrajaya.Among my cycling buddies,it is known as The Forbidden Bridge.I gave it this unique name because the public is not given access to cross it.It is mainly for maintence vehicles.A few years ago,we managed to break the rules and was chased by the guard.We had a good laugh at ourselves behaving like naughty boys..
Not many people like to cycle from Umai Cafe to Taman Saujana Hijau(TSH).One main reason was the long uphill climb from Taman Wetland.Yesterday,Tajuddin changed the route and we had nine PUR members with us cycling from Umai Cafe via Presint 10(PM Residence) all the way to TSH. When we arrived at the elevated garden some five-storey high,we stopped and enjoyed the views and took photos with the colourful flowers.One friend said it is like in Amsterdam.And that reminds me of our PUR cycling group members who are on their way to ride in Holland. To my fellow Malaysians and visitors,please take some time to visit many beautiful gardens in Putrajaya.You can go with your cars and walk there or ride your bicycles like we do every week.It is good for the body and the soul. Well hey there pretty lady! She’s got her matching gloves and beanie, and just cruising along on her Old Dutch, carrying some things in her basket and listening to music. This freezing weather isn’t wearing her down at all…it’s almost making her smile! 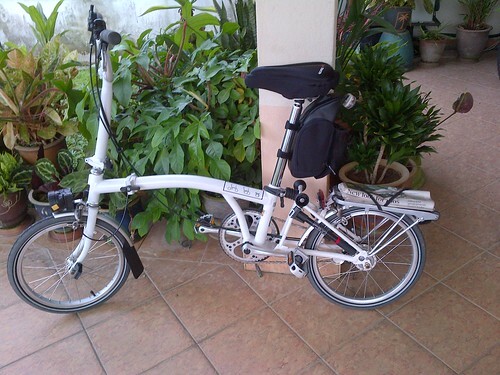 I am doing my small part by going to masjid using my Dahon folding bike. This photo reminds me to be grateful for all those beautiful bicycles that I have and I can still cycle for fun and exercises...Just be grateful for what we have and ride on..C'est la vie..
It’s a gathering event; Brompton owners to get to know one another. All are welcome to join in. Meeting point: Umai D’ Lake Carpark. This is a fun ride so make it interesting! We encourage participant to wear a suit jacket, collared shirt and tie or jersey alike. If you thing you have your own styling such as ‘wong fei hung’, P Ramlee, Batman please do so. Eventually as long you’re comfortable you may decide. This event is open to Brompton rider only. Unisex open category, But, participant age below 15 is mandatory to obtain consent/authorization and accompany from respective parent. Estimated 20 riders or more. 13km+ routes will take us through within dedicated bicycle path Core Island. 2. 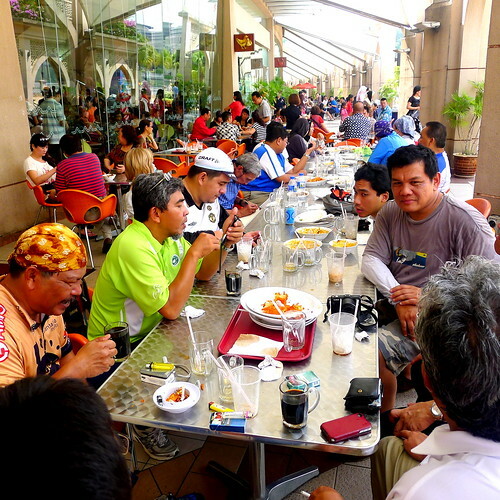 F&B Buffet budgeted RM300 (Only for Registered ride, participants family and friend are at their own expenses. Registration closing date: 12th July, 2012. 0700-0730 Registration attendance, we encourage confirmation of participant before the actual event. 0730 (10minutes; welcome speech & safety briefing) Participant set up. 1000-1200 Makan, Free & easy, Rest & Relax, Get to Know & Indulge. It’s compulsory for all riders to wear proper helmet, No helmet No ride! This is a self support event. Every rider must play a role for their own safety and other road users. Obey & observe all traffic rules at all times. Rider to make sure that your bicycle is in good riding condition. For those who have medical condition, please seek your doctor’s advice before you ride. Event content is subject to change without prior notice. Yesterday,I decided to ride alone at Taman Saujana Hijau,Presint 11.To my pleasant suprise,all the people were walking there except me-riding my Dahon folding bike.My aim was to improve my climbing and endurance.Alhamdulilah,I did two loops at the Taman Saujana Hijau and one loop around the Presint 11 as shown in the map above. Why ride alone?By being alone,I did not have any peer pressure to ride beyond my capacity and it gave me private space and time to think on what bothers me.It is just like a saying,"Let us take a walk on this matter..". After my morning walk at Taman Saujana Hijau yesterday,I went to The Souq to get my breakfast.However I was too early-it only opens at 9am.While waiting for the doors to open,I had a conversation with a tour guide.He told me there are about 100 busloads of tourist come to Putrajaya everyday.They will visit the Masjid Putra and have roti canai with udang galah.The mamak shop there makes tons of money everyday! My question was what the tourists see and experience when they visit Putrajaya?Seeing Putrajaya by bus is a great injustice to what Putrajaya has to offer.My experience told me that if I were to come 1000 times to Putrajaya by car or by bus,I can only see less than 10% of what Putrajaya has got to offer especially to tourists.Walking is a bit too slow to see many beautiful sceneries here but cycling is a good alternative.Please click here to see my photo collection of nice sceneries in Putrajaya. Perbadanan Putrajaya has put up a bike rental kiosk at Info Centre.To date,I seldom see locals or tourists cycling these bicycles.The rental is quite cheap but please open it at 7:30am to 7:30pm so that people have time to rent the bikes.At the same time,a cycling guide should be available. Another point of contention is the hotel accommodations.How many of us can afford to stay at Shangrila or Pullman?? ?We need more 2 to 3 stars hotel in Putrajaya. Over to you ,Tan Sri Sam..
To all my cycling buddies,I took this photo tonight during PNR at Putrajaya next to Info Centre.I plan to go for a MTB ride this Sunday and if you are interest to go off roads,kindly contact me.Tips on night shots here. 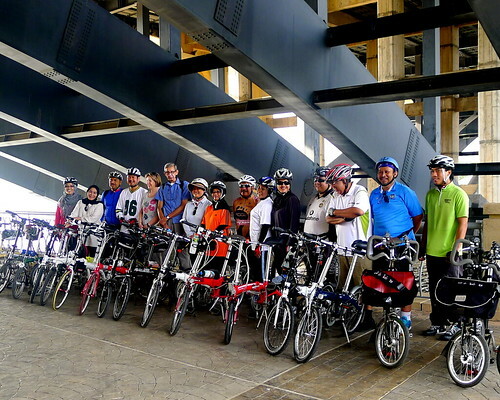 The photos were taken during yesterday morning ride at Putrajaya with my guests Guus and Marjolein from Holland and and my riding buddies from PUR group.along the route around the Core Island,we stopped to take photos of beautiful sceneries as the air display of hot air balloons and gliders.We all have a great time!Thank you Allah for your great rahmah on us and everyone your partipations!!! To all my readers,I wish you a good week ahead.God bless and to fellow cyclists,do be extra careful when you are on the public roads. "Dear PUR Members,First let me offer my thanks and gratitude to our Merciful Lord Allahu Rabbul'aalamin for His Grace that a dozen of us had enjoed our cycling in good weather,comfort and safety.Second,I wish to thanks my guests from Guus and Marjolein from Leiden,Holland for accepting my invitation to ride in Putrajaya.Thirdly,I wish to thank Tuan Mohd Niza from Perbadanan Putrajaya for joing us the ride and last but not least my riding buddies from PUR who took their time off and joined this morning ride to welcome my guests.My guests requested me to say thanks to all of you for this beautiful morning ride!Thay had great time with us and i hope you too."